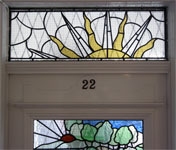 Behind the large facades in the residential homes and flats of London lie hidden treasures of stained glass. These are commomly found in stairwells, entrances and windows facing courtyards. The maintenance is often run by property management companies that contact us to undertake repairs. Here we see a fascinating collection of 'arts and crafts' stained glass. In this gallery, all the images shown are from the same property. 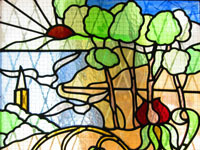 These stained glass units were restored, repaired, replicated and cleaned over a period of three months.